Was Amazon's Kindle Fire 2 just approved by the FCC? 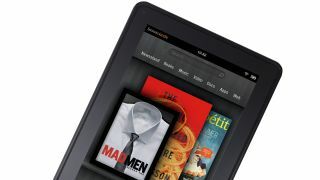 The Kindle Fire has been a fairly big success for Amazon, but that hasn't stopped rumors of a second, bigger tablet coming from the company from circulating. Though all talk about the Kindle Fire 2 has been circumstantial to this point, a recent discovery of some FCC paperwork may just have grounded the device in reality. According to The Digital Reader, documents for a new tablet were filed by Harpers LLC, and have been cleared by the FCC. After a bit of detective work, it's been discovered Harpers LLC is a front created by CSC Entity Services, a legitimate company believed to be hired by Amazon to file the FCC paperwork so this new tablet could not be traced back to them. Amazon has played this game before, and filed FCC documents through these shell companies since the advent of the second Kindle. There are even reports indicating Amazon used three different front companies to hide the original Kindle Fire from prying eyes last year. A peek inside the paperwork reveals the new tablet will use a 4:3 aspect ratio like the iPad instead of the 16:9 ratio used by many other Android devices. Digital Reader also believes the filings point to the Kindle Fire 2 being a larger 9-10" tablet, but there are very few other details, as the documents available for perusal are a bit limited in their scope. While it's still short of a confirmation of the Kindle Fire 2's existence from Amazon, it appears the online shopping conglomerate is taking the next step in efforts to better compete with the rumored iPad Mini and Nexus 7.